September! The beginnings of all good things, in my eyes. I know that for some people…okay, almost all people…that the end of summer is a mourning time. People love the beach, and cookouts, and shorts, and volleyball, and tall, cold drinks. I get it. I love swimming, and cookouts….but that is pretty much where my love of the season ends. I am not a fan of days where you wake up sweating, and start sweating as soon as you step out of the shower, and you sweat while you make breakfast that isn’t going to settle well because you’re sweating too much. I don’t enjoy the feeling that you have to get moving ASAP because “it’s nice out.” These days to me mean that I am wrestling two sweaty kids into the car and hustling to an overcrowded beach where I will most certainly get a parking ticket. I won’t be able to swim in the ocean because I will be too busy chasing the baby and building sand castles and passing out drinks and getting sunburned. I will be anticipating, at this time, the after-sun headache that I will experience as I take on a death match with the two year old who doesn’t want to leave the beach. And the sand, oh the sand. The lack of structure that summer provides may be relaxing to many, but for me, it just equals a lack of productivity and creativity. I get the least amount of writing done in the summer. Something about running for shade from the blazing, murderous sun just doesn’t spark the warm and fuzzy in me. But now! Now is the time that I feel enriched by my family. Long walks by the river, looking for turtles and hearing the fall leaves rustle in the breeze. That fireside smell that fills the air, the jacket weather. I do love weather where you can wear a tanktop and hoodie, but still are comfortable in flip flops. Also, sweatpants are fully realized right now as the wardrobe option of the year. And pumpkin everything! Pumpkin is my favorite flavor, scent and color. I look forward to it all year. And it signifies pumpkin and apple picking on chilly days, with fresh apple cider and donuts. Not to mention the amazing Pumpkin Spooktacular at Roger Williams Park Zoo, my favorite Halloween activity. Hundreds of elaborately carved pumpkins done by local artists set to creepy music and lighting coupled with trick or treating. This is the best thing ever. (Last year there was a Bea Arthur pumpkin.) But most of all, I love that this time of year makes us all want to curl up on the sofa with our family under blankets and watch movies over hot drinks. Real quality time without the effort of the beach. No after-sun headaches allowed. Having this effortless time at home to relax is central to my desire to write. It is how I started Running Home, in the coziness of my home with my baby, to the smell of cookies and pumpkin candles. 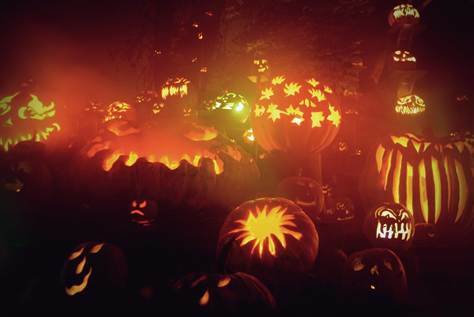 Roger Williams Park Pumpkin Spooktacular. How awesome is that? Now,my baby started Kindergarten! We love school in this house, and so this is a wonderful thing. Not only do I get to buy school supplies, an addictive thing for me, and watch my brilliant child become even more brilliant, but I get to do so with an extra two hours of my day to myself. This, alone, fosters creativity. I am already anxious to get on Running Away, and to have structured writing time that isn’t just the time I am not caring for the kids. There’s a lot to be said for structure. Kristen and I have already got a schedule set in place to make the final edits to Immortal Dilemma and Running Home, as well as to really get started on our side project works that will make the readers of our novels happy. The emotion that Fall stirs in me just spills onto paper, and now the pride that I have in this amazing little boy overwhelms me, and begs to be turned into something that won’t make me explode. It’s hard to feel like that when I am sweating, so welcome Fall! So, put those filthy beach towels away, folks, and start feeling the freshness of Autumn!